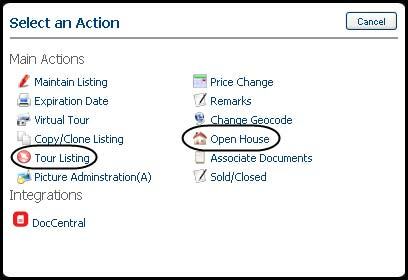 Open House and Tour functionality allows you, the listing owner, to add to your listings searchable dates for upcoming open houses and property tours. Members of the MLS, using the Open House and Tour search, can find open houses and property tours. Paragon retains these events, as a part of the listing record, for future reference. 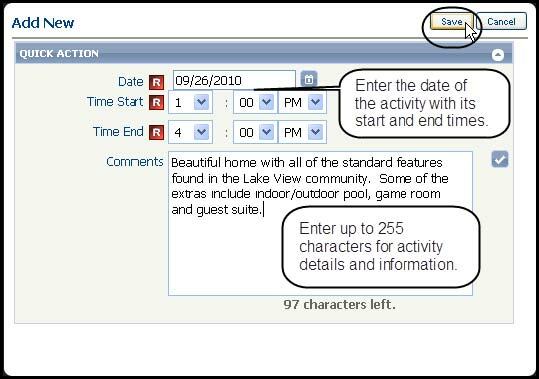 The tool to add a date for an open house is the same tool to add a date for a tour. Open House is a public showing of the property. Tour is a private showing of the property just for real estate professionals. Some MLSs, boards and associations also refer to this as a Brokers Open House, or Caravan. On the Banner Menu, click Listings and under Maintain click Listings. The Listing Maintain search tool opens. You can search for your listing in two basic ways. A. Search for your listing by entering in your MLS # and clicking Go. B. Search for your listing by address, class, status or listing owner. Click Search for a list of properties. Locate the property in the list and click Select an Action on the right side of the property’s row. A modal will open. Click Open House or Tour Listing depending of the activity you want to add to your listing. A window will open. In the workspace, click the + sign to add a date for your open house or tour. A modal will open. Enter the details for your activity. Enter the date of the activity. You can use the calendar tool or type in the date in the mm/dd/yyyy format. Enter the start time of the activity. Enter the end time of the activity. Add up to 255 characters in the comments box to communicate details and information about the event for MLS members searching for open houses or tour listings. You can add as many open houses and property tours to your listing, as you want.